One of the most common used program in this generation of computer is the Corel Draw. 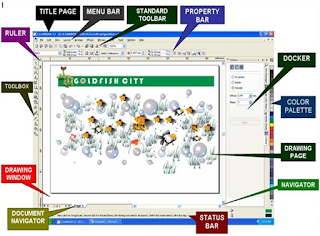 Corel Draw is an advance use of the graphics application with the state of the arts command application inside the application window. With the 3d effects both the color application and the object itself through the features of the tools command button position on the left side of the window. This version has a precise target measurement of the drawing you design using the millimeter of the built-in ruler installed in the window and can be convert to into other measurements. You can design here a logo, enhance support for the scalable victor graphics (SVG), Drawing using shape recognition, snapping enhancements, Text Alignment, enhance symbols, and other more enhance using this version 12 of Corel Draw. In this post that I should introduce to you is the parts and function of the application window. We should understand first the environment of this Corel Draw application before you can proceed in the complex application of the design you want. As a designer you should equipped with the creativity that forecast in your mind that will output in a meaningful subject of a design. Or draw whatever instructions we should to draw from our clients that they cannot perform. The very effective is drawing first in the sheet of paper before the Corel Draw Window page. Just read the parts and function written below and this according to the Corel Draw Company. Just familiarize also the post picture shown above left side of this post. Menu Bar- this area is containing a pull- down menu options. Property Bar- a detachable bar with commands that relate to the active tool or object. For example, when the text tool is active, the text property bar displays commands that create and edit text. Toolbar- a detachable bar that contains shortcuts to menu and other commands. Rulers- horizontal and vertical borders that are used to determine the size and position of objects in a drawing. Toolbox- a floating bar with tools for creating, filling, and modifying objects in the drawing. 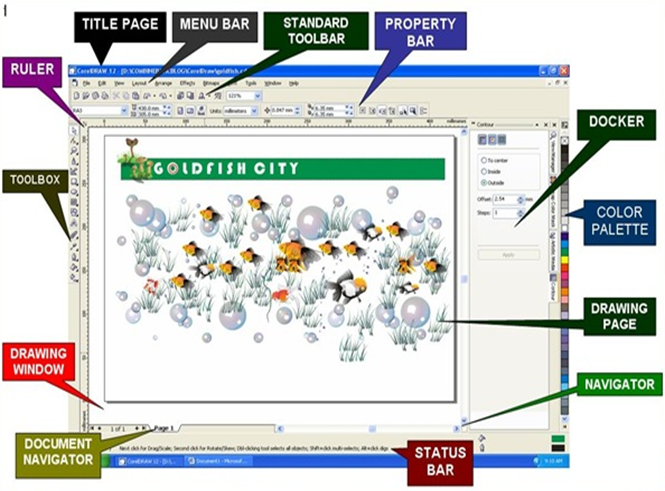 Drawing window- the area outside the drawing page bordered by the scroll bars and application controls. Drawing Page- the rectangular area inside the drawing window. It is the printable area of your work area. Color Palette- a dockable bar that contains color swatches. Docker- a window containing available commands and settings relevant to a specific tool or task. Status bar- an area at the bottom of the application window that contains information about object properties such as type, size, color, fill, and resolution. The status bar also shows the current mouse position. Document Navigator- the area at the bottom left of the application windows that contains controls for moving between pages and adding pages. Navigator- a button at the bottom- right corner that opens a smaller display to help you move around a drawing. These are only the parts of the application window. Other parts on the tools bars that consist of the commands buttons use for the application. This program have a different versions and you must considered the system requirements of your computer if you want to installed this program. If you want to know more about of this program and the installation disk just follow this link: COREL DRAW .